Today ends this week's theme of Spring has Sprung. 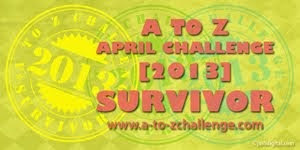 I'm taking a break to prepare for the Blogging from A to Z April Challenge. If you're a blogger, maybe you'd like to participate. Click on the badge below. See you all, dear readers, back on April 1. Have a wonderful time out there. 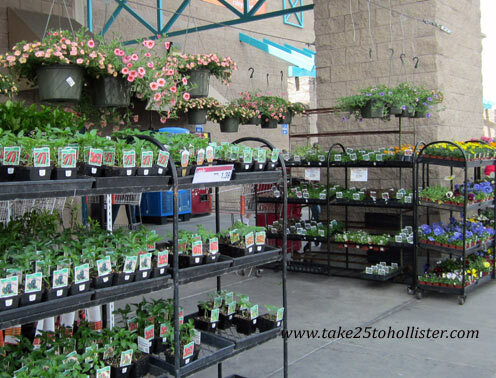 Nob Hill has put out displays of veggies and flowers that are ready to go into the ground. A sure sign that Spring has arrived. What will you be planting in your gardens this year? 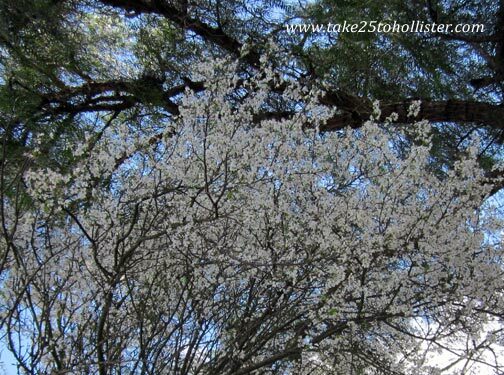 The theme for this week, March 10 to March 17, is Spring has Sprung. 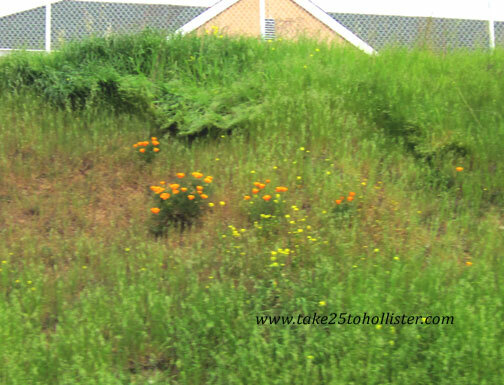 What speaks more of the start of Spring than the wildflowers that pop up on hill sides, along highways, and in sidewalk cracks. 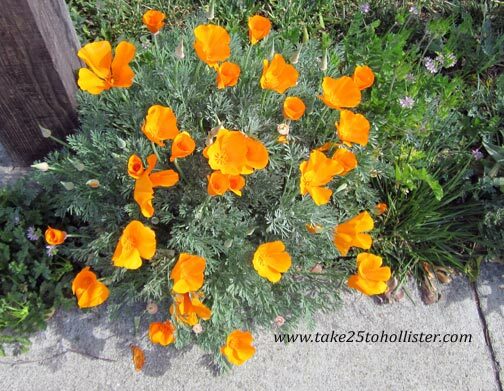 And, in particular, the California State flower. Of course, you know what it is. They're every where! 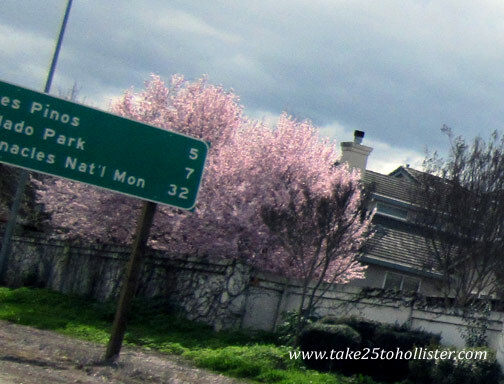 Those blooming trees. The Gabilan Range flanks the San Juan Valley to the south. I love how the hills and mountains are green, green, and green in the Spring. It's just like Julie Andrews sings, "The hills are alive with the sound of music." Doesn't matter if the day is overcast or one with blue skies and fluffy clouds. 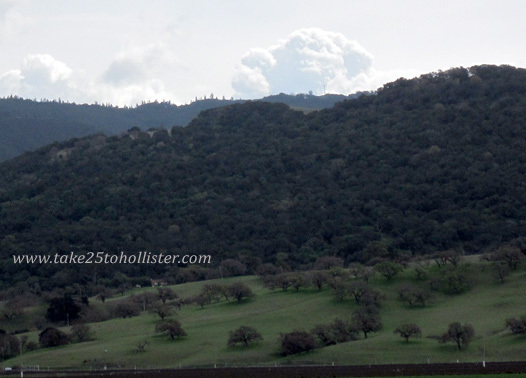 The Diablo Range borders the Hollister Valley to the east. 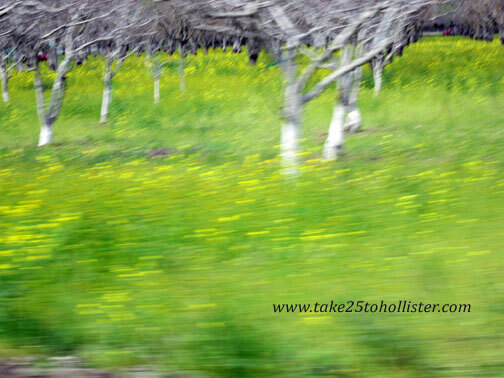 The blur of yellow as we drive past fields and orchards. Ah, here comes a stop light. A chance to take in the yellow up close, as well as the faint aroma of mustard. By the way have you ever eaten wild mustard? It's quite yummy sauteed in olive oil with a healthy dose of minced garlic and a couple shakes of soy sauce. 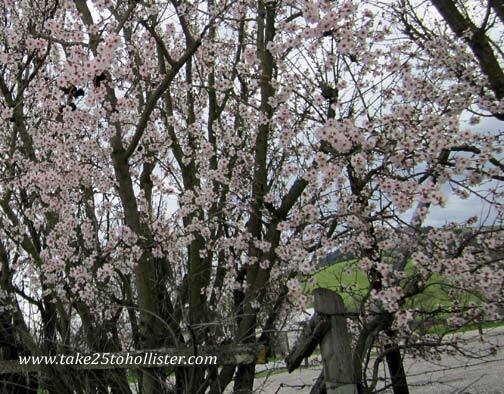 The theme for this week, March 11 to March 17, is Spring has Sprung. It's the second day of Daylight Savings Time. What better way to begin this week's theme, doncha think? Monterey Bay Aquarium. Fisherman's Wharf. Cannery Row. 17-Mile Drive. Presidio. Asilomar Beach. Big Sur. Carmel Mission. California State University, Monterey Bay. 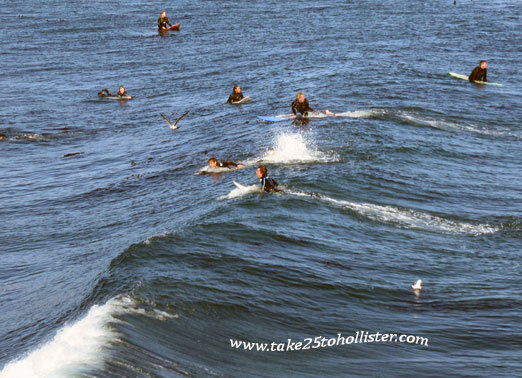 These are just a few of the major attractions in the Monterey Peninsula. And, of course, the Pacific Ocean. The Monterey Peninsula consists of several communities, including Marina, Seaside, Sand City, Monterey, Pacific Grove, Carmel-by-the-Sea, and so on. 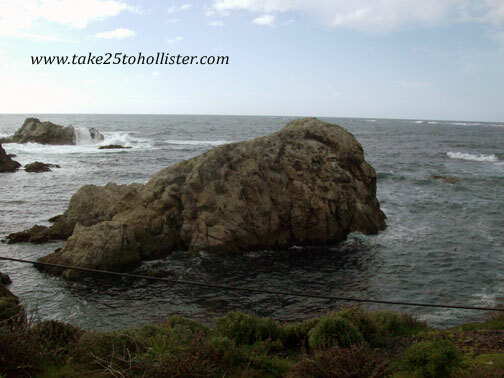 Hollister is about 32 miles away from the northern end of the Monterey Peninsula. We are fortunate. The theme for this week, March 4 to March 10, is the Pacific Coast. 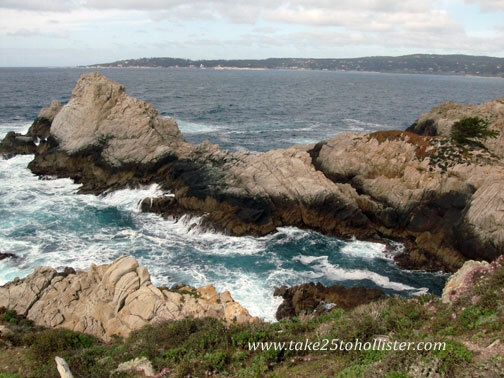 The Point Lobos State Natural Reserve is another gem on the Pacific Coast that is near Hollister. It's only 48 miles away, just to the south of Carmel-by-the Sea off of Highway One. I suggest you turn off all your electronics when you visit the reserve so you can truly have a relaxing experience. Everything is magical, from watching the ocean waves to viewing the wildlife to seeing the different shapes of trees and rocks. 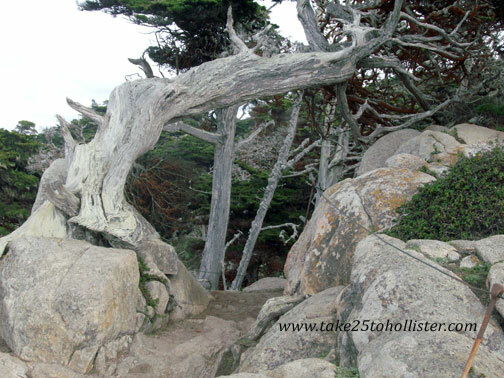 Point Lobos is the general name for the natural reserve and two adjoining marine protected areas. It's short for Punta de los Lobos Mariños, or the Point of the Sea Wolves. The sea wolves refer to the rocks off this point. Hmmm. 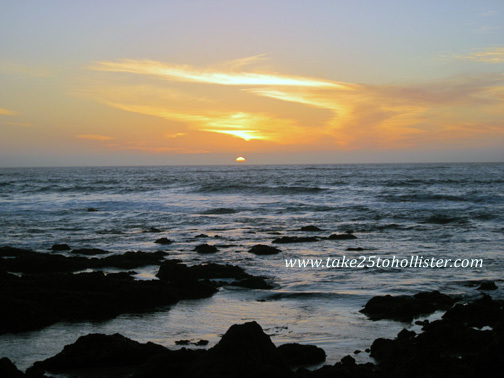 The theme for this week, March 4 to March 10, on Take 25 to Hollister is the Pacific Coast. 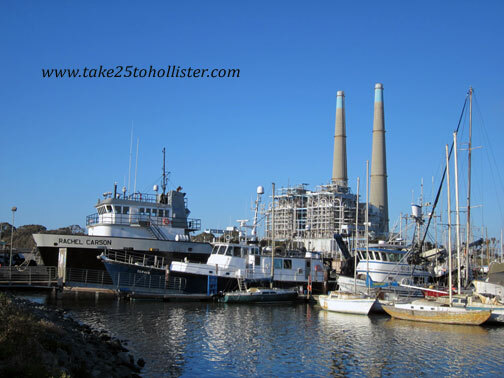 It's about 28 miles from Hollister to Moss Landing, a small harbor village off Highway One. You know you're there when you see the menacing looking power plant across the highway from the village. When I was a kid, the brother told me it was the M & M factory, which I believed for the longest of times. Whenever I see the plant, I still like to pretend that I believe M & M candies are being made in it. 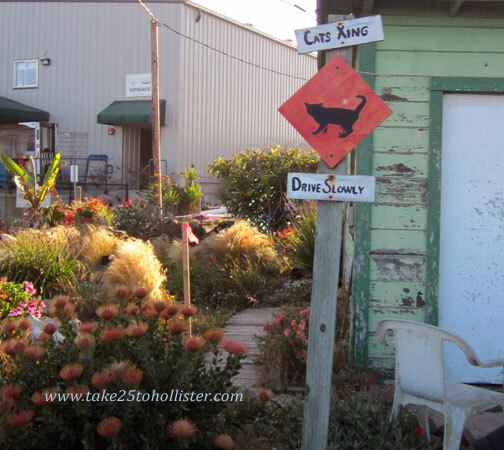 Moss Landing is a cool place to hang out. You can walk along the beach. Check out the antique shops. Eat at yummy restaurants. Fish. Bird watch. 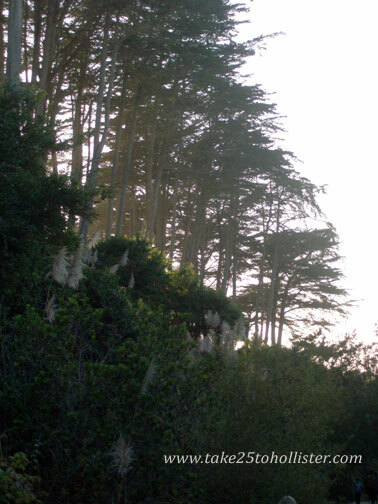 Go up a little ways and hike or kayak the Elkhorn Slough. And a lot more. One caution: It can be a long wait to turn left from Highway One into Moss Landing. Also, if you turn left onto the highway from Moss Landing. 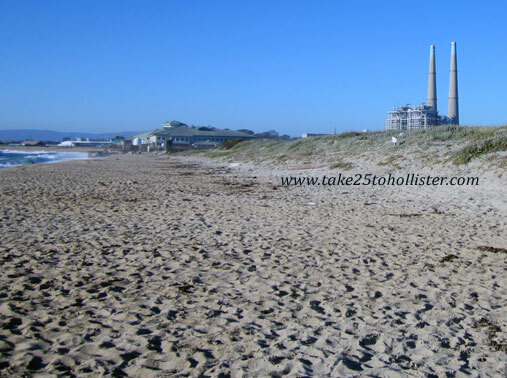 For more info about Moss Landing, check out these links. 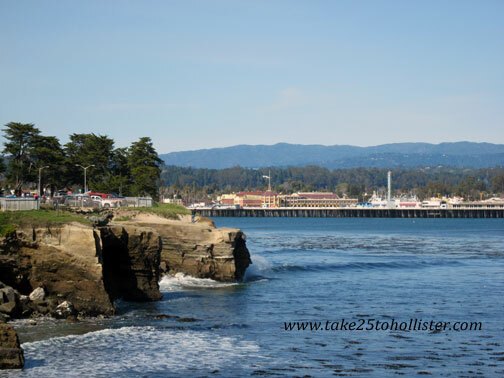 The Monterey Bay includes the coastline of both Monterey and Santa Cruz counties. Monterey is the southern end, while Santa Cruz is the northern end. Usually, we think of the south as being warmer than the north. But, when it comes to beaches in this region, nope. The beaches of Santa Cruz county are warmer, once the fog moves out. There are more than 20 public beaches on the Santa Cruz county coastline, which stretches from Watsonville (south) to Davenport (north). Public access is also available to beaches which involves passing through private property, such as the Seascape Beach Resort in Aptos. to the beach at the Seascape Beach Resort. Have you ever seen northern elephant seals up close? Want to? 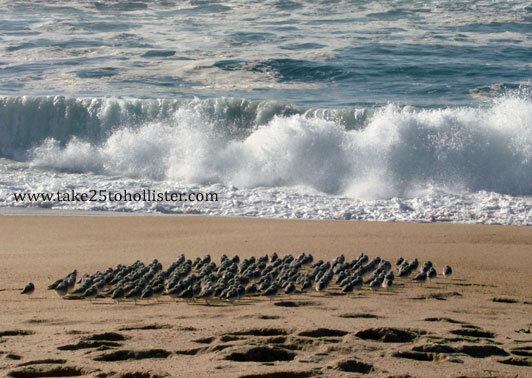 There are a few places along the Pacific Coast where northern elephant seals gather on the beach throughout the year. 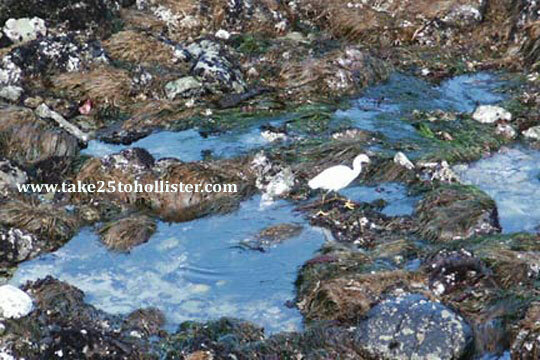 One such place is the Año Nuevo State Reserve, which is part of the California State Parks system. 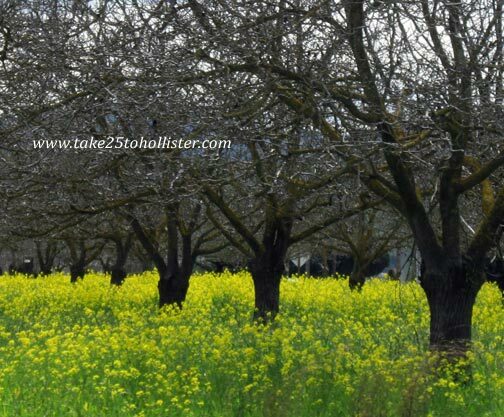 It's about 65 miles northwest of Hollister, or about 20 miles north of Santa Cruz on Highway 1. From December to March, reserve visitors can only view the northern elephant seals on guided walks. During this period, the mammals mate, give birth, and wean their pups that later head to sea in April. 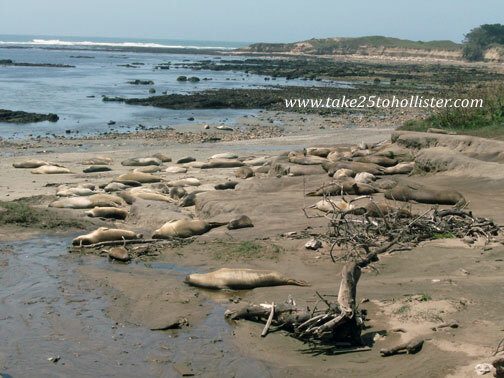 In the spring and summer, the elephant seals return to Año Nuevo to molt. 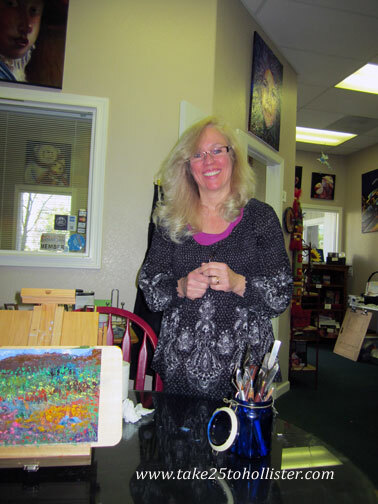 Local artist Shannon Grissom opens her studio in downtown Hollister every Thursday afternoon for Creative Escapes. 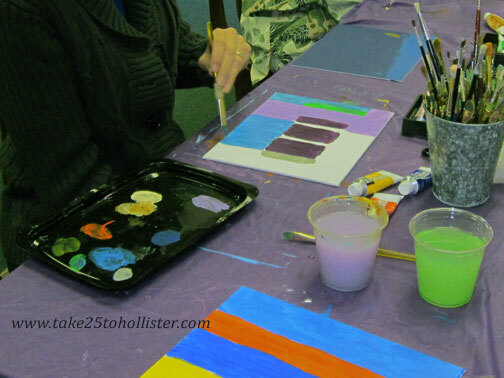 For a flat admission fee and a fee per project, children and grownups are welcome to use her art supplies . 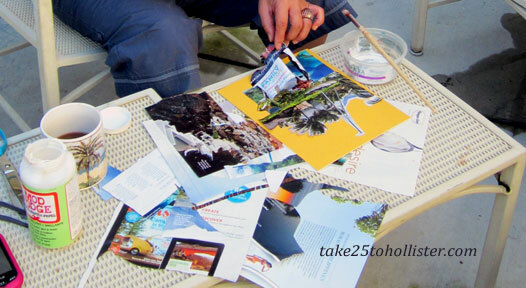 . .
to paint . 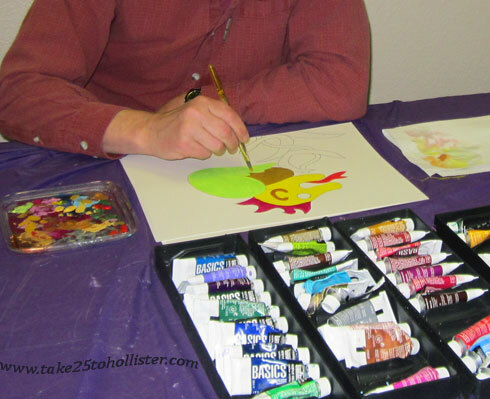 . .
Last Thursday, a bunch of friends and I spent a few fun hours in Shannon's studio. 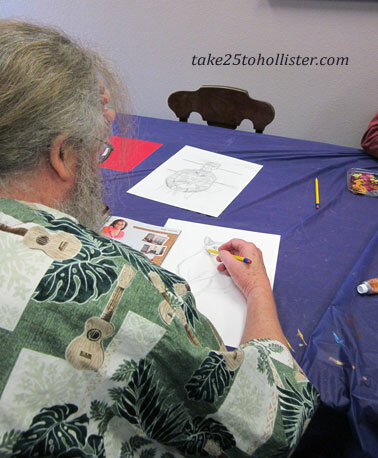 None of us really had an idea what we wanted to do other than to play with art. Although game about the adventure, a few of us were wary about the whole idea. I, for instance, have been chipping away at my fear of art ever since my first grade teacher told me, "Susie, draw your cows on the ground." An afternoon with Shannon put a lot of my apprehension in the trash bag. If you'd like to see what I ended up creating, you can view it here at Don't Be a Hippie. Santa Cruz is home to the Giant Dipper Roller Coaster, as well as the University of Santa Cruz. 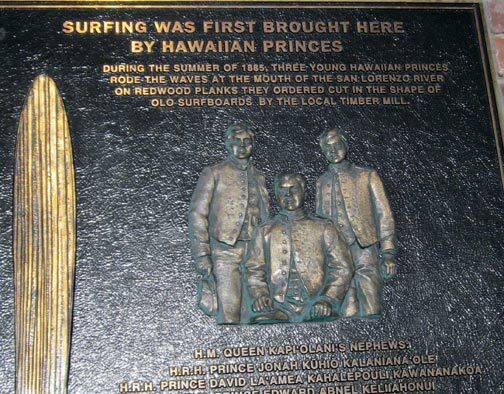 The beach town is also known for being one of best surfing places along the Pacific coast. 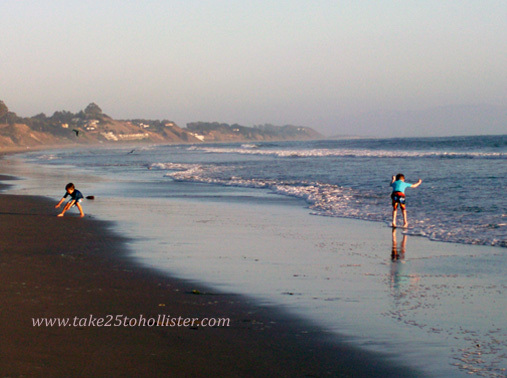 According to mapquest.com, Hollister is about 44 miles from Santa Cruz. And, when I was a kid, my family drove over every Fourth of July to hang out at the Boardwalk. The fog always lifted by 11 a.m. 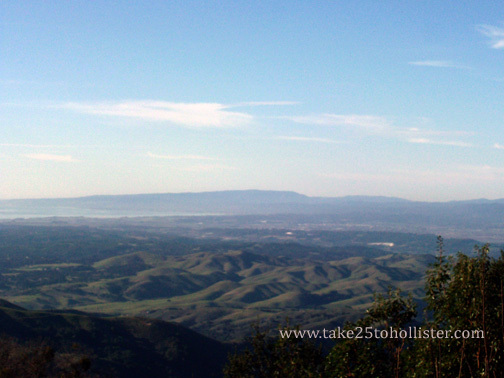 Here's a look of the Pacific Coast from Fremont Peak above San Juan Bautista. That light blue "line" at the foot of the mountains, on the left, is the northern end of Monterey Bay. To see how Fremont Peak looks like from over there, click here. You've heard the stories. Maybe you have a doozy of a story yourself. 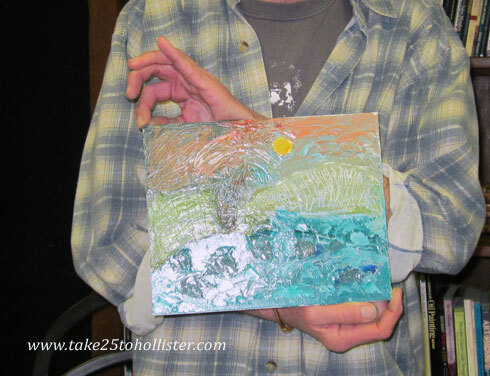 A middle-aged (or older) Hollister local (current or former) is standing in a line at a theater (or store or restaurant or somewhere else) in another city. He (or she) notices the young man (or woman) standing next to him (or her) wears a sweatshirt with the word Hollister on it. 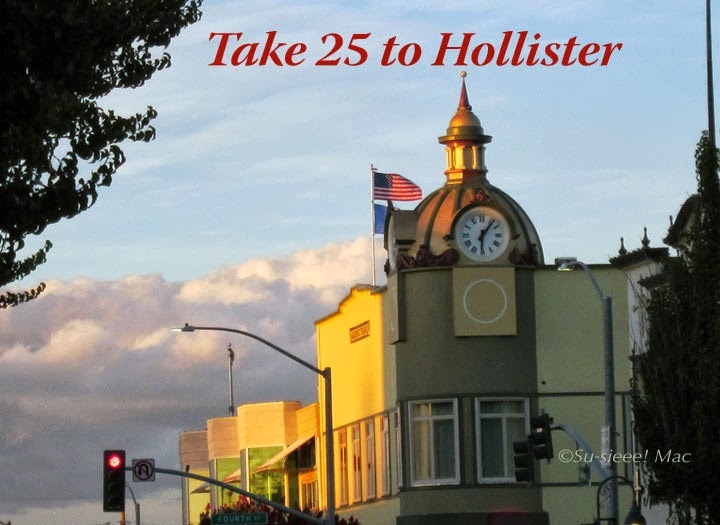 So, of course, the Hollister local starts up a conversation. 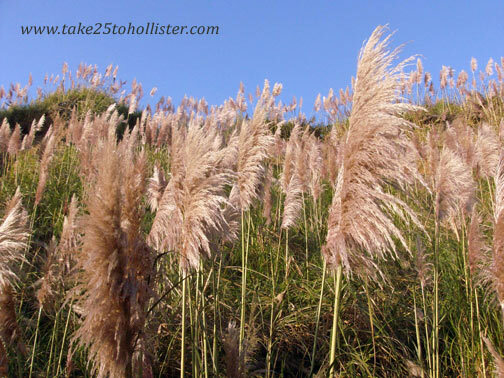 "Hi, I'm from Hollister, too," the Hollister middle-aged person says. "Huh?" the sweatshirt wearing young person says. "Aren't you from Hollister, California?" "Oh, sorry, I just saw your sweatshirt and thought you were from my hometown." "I bought this in the Hollister store. 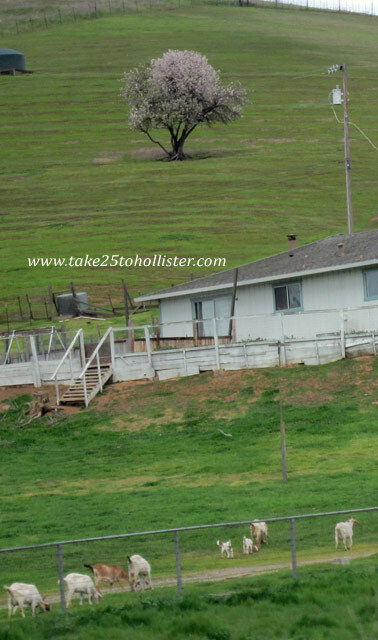 You're from Hollister, California? Wow. Are you a surfer?" 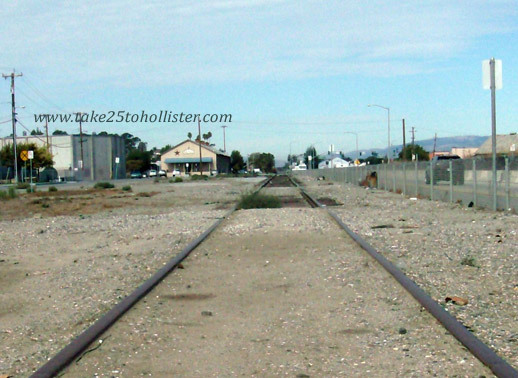 What better way to end this week's theme of Trains and Railroads with a photo of the end of the Union Pacific line in Hollister. Curious about the history of railroads in our area? Check out these links. 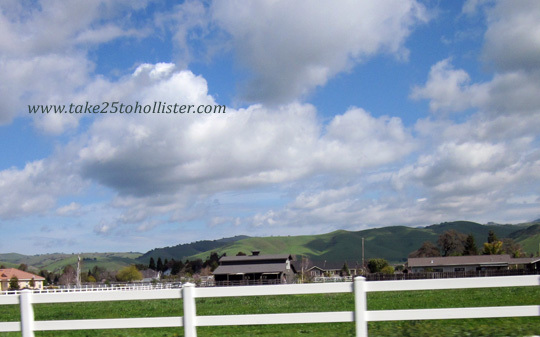 Until the Southern Pacific built the railroad in Hollister in the 1870s, San Juan Bautista was the bustling metropolis in this area. But, that's a story for another time. 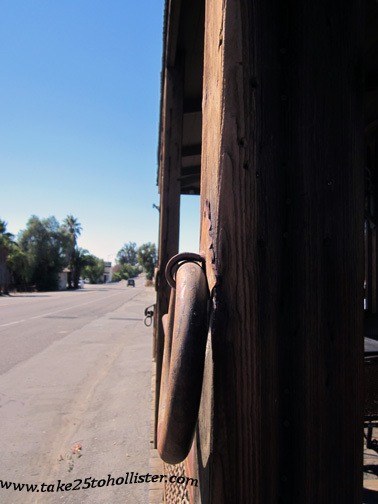 In 1907, a railroad did eventually come to the mission city. Originally run by the San Juan Pacific Railway, it became part of the California Central Railroad several years later. 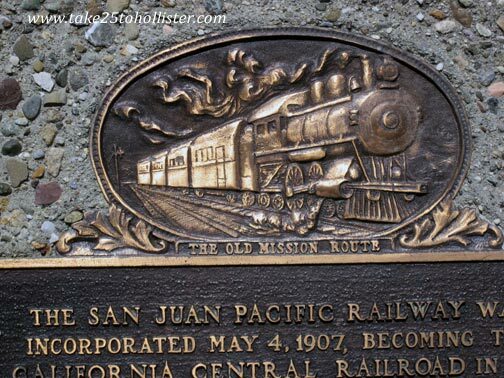 The San Juan Pacific Railway was incorporated May 4, 1907, becoming the California Central Railroad in 1912. Some of the locals referred to it as the San Juan Terrific. Built to haul the expected large quantities of Portland cement from the old Mission Cement Company Plant nearby, the mainline extended 7.94 miles from Chittenden to San Juan Junction. Ceasing railroad operations in 1930, the track was ripped up after the last locomotive, Ocean Shore No. 5 was steamed up and shipped to Nevada in 1937. A narrow gauge 'road' reached the limestone quarry up the San Juan Canyon. What you're looking at is Highway 25 in Tres Pinos. You're looking west from a hitching post at the 19th Hole Booze and Food. Tres Pinos is a quiet little village, but over a 100 years ago, wowza! Back in 1873, the Southern Pacific ran a line to Tres Pinos. Soon the town became a busy shipping center for hay, cattle, and grain. The railroad also shipped quicksilver for the New Idria Mines. The railroad ran two passenger and two freight trains daily, states the Inn at Tres Pinos Web site. 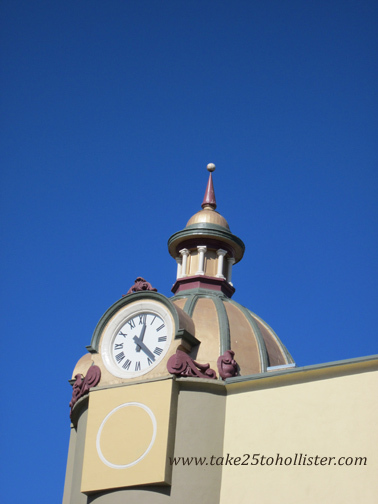 According to the go.to/tres pinos web page: "Among the businesses in downtown Tres Pinos were seven enormous grain warehouses, a scale house, six saloons (one that was illegal), bullfighting arena, and large hotel (as well as rumored bordellos)." The story goes that initially the Southern Pacific planned to build the railroad to Paicines, which back then was the original Tres Pinos. What we know as the town of Tres Pinos today was then called Paicines. After laying railroad lines to Paicines, the Southern Pacific no longer wanted to go further. The railroad somehow got the two communities to switch names by 1874 so that it can say it completed its objective: Build a railroad line to Tres Pinos. The Southern Pacific dismantled the railroad line in 1944.